Two years ago, Save The Bay gained an energetic, determined volunteer in Danielle Perry, who works with children and does research at Save The Bay’s South Coast Center in Westerly. 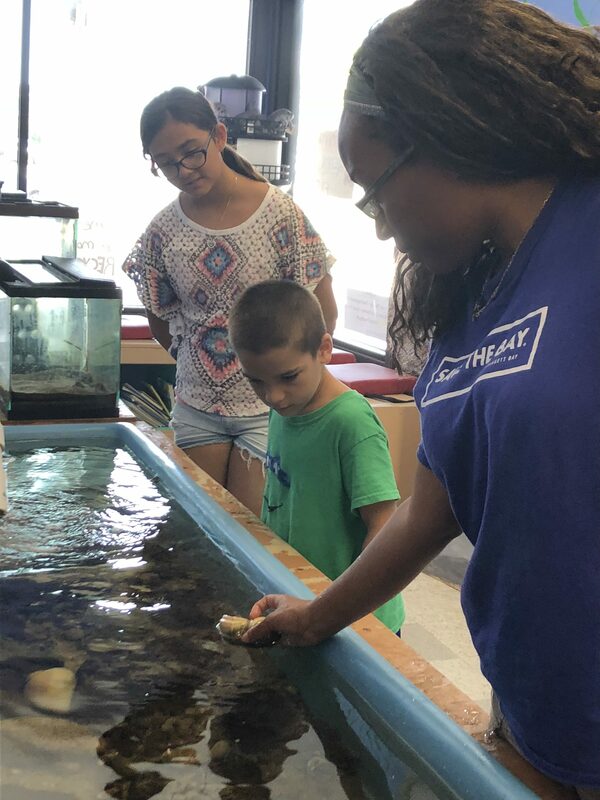 The South Coast Center is a small, interactive aquarium where visitors can learn about the diverse habitats and animals of the region and Save The Bay’s work in Rhode Island’s salt ponds and southern coast. Danielle wanted to be involved in the local community and learn more about conservation and restoration firsthand. “Save The Bay seemed like a great opportunity to accomplish my goals and expand my experience in environmental management and community engagement,” she said. Volunteer Danielle Perry shows young visitors critters in the touch tank at the South Coast Center in Westerly. The South Coast Center is a cozy storefront inside the old McCormick’s department store building on Westerly’s Broad Street. Danielle shows visitors the interactive touch tank, describes the south coast watershed map and reads stories for children in the kids’ story time area. She exudes enthusiasm and passion as she meets the visiting children and adults and educates them about Rhode Island’s southern coast. Determined to help make a positive environmental change, Danielle also enjoys getting her hands dirty with other volunteers on many habitat restoration projects. “It is nice working with people on a common goal and accomplishing something important together,” said Danielle, who has participated in salt marsh restoration monitoring and planting as well as water quality restoration in the coastal waters of Narragansett Bay. During her restoration work with Save The Bay, Danielle has learned so much about the issues salt marshes are facing that she’s developed her graduate research around the topic. “Save The Bay has become a large part of my Rhode Island and graduate school experience, and the individuals working there have been very influential in this journey,” she said. With a special place in her heart for Narragansett Bay, Danielle wants to see the Bay thrive and witness restored habitats and improved water quality. “Saving the Bay has important implications that go beyond Rhode Island and New England. The strategies used within the Narragansett Bay watershed could be implemented in other systems across the country. Saving the Bay could lead to saving other estuaries in the country,” she said. Visit Save The Bay’s South Coast Center at 12 Broad Street, Westerly, RI from 10 a.m to 3 p.m every Monday, Wednesday, Friday and Saturday.